Introduction: Bonding of orthodontic attachments with acid etching is the most commonly used orthodontic procedure. However, there are certain limitations with acid etching procedure like/moisture contamination, etching time, the concentration of adhesive, etc., Moisture insensitive primers (MIPs) were introduced to overcome these limitations. Objectives: The aim of this study is to compare the shear bond strength of orthodontic brackets bonded with a MIP (Transbond MIP, 3M Unitek) against a conventional primer (Transbond XT, 3M Unitek) when contaminated with saliva – in vitro study. 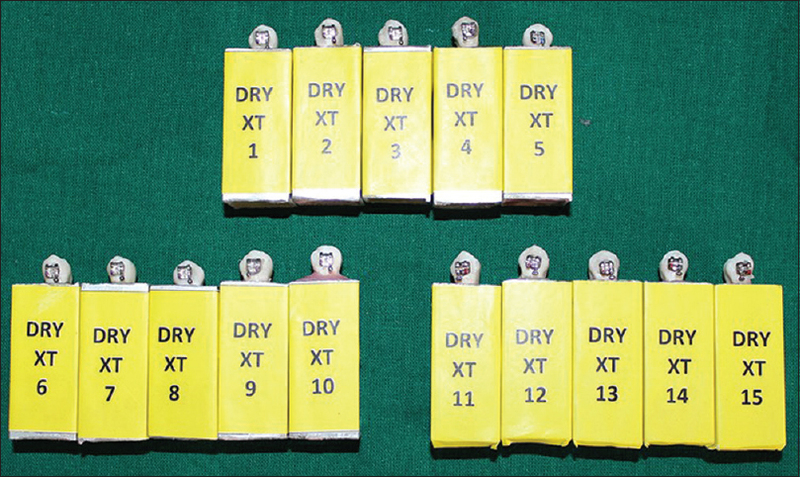 Methodology: Sixty maxillary premolars extracted for orthodontic purpose or due to periodontal involvement with sound buccal surfaces were collected, cleaned thoroughly, and stored in 0.1% (wt/vol) thymol at room temperature for 2 weeks. Following materials were used: Transbond XT Light cure adhesive (3M unitek), Transbond XT primer (3m unitek), Transbond MIP primer (3M unitek), and Metal brackets (3M unitek). A commercially available artificial saliva (AQWET, CIPLA) was used for contamination purpose. Ivoclarbluephase N LED light curing unit were used for curing purpose. Results: Mean bond strength was well above the clinically acceptable bond strength values indicating the use of these hydrophilic bonding materials in contaminated environments (8.5 Mpa for Transbond XT and 9.25 Mpa for Transbond MIP). On comparison of bond strengths of MIP and XT when contaminated with saliva, statistically significant values were obtained with contamination with saliva after primer application. There was a statistically significant increase in the bond strength after primer application (P = 0.233) and before and after primer application (P = 0.027*). Transbond MIP can be used to achieve adequate bond strength in saliva contaminated condition. Conclusion: Under dry condition, the shear bond strength of conventional primer (TRANSBOND XT) was significantly increased when compared to MIP. Under wet conditions MIP (TRANSBOND MIP) showed the highest shear bond strength and hence can be considered as a material of choice in wet conditions. Bonding is an integral part of orthodontic treatment. It involves etching as primary procedure. Buonocore introduced acid etching technique in 1955, where phosphoric acid preparation was used to obtain microporosities. He suggested the concept of micromechanical retention, wherein resin tags achieved principal adhesion to acid etched enamel. Newman in 1965 introduced the novel concept of bonding orthodontic attachments to tooth surfaces using epoxy adhesive. This procedure improved the overall treatment results by eliminating band occupying interdental spaces decreased gingival irritation, and easier removal of plaque and decreased risk of calcification. Artun and Bergland in 1984 conducted clinical trials with crystal growth conditioning as an alternative to acid-etch enamel. Brant et al. in 1977 discussed about the factors affecting the bonding of orthodontic attachments to the tooth surface and concluded that for bonding failures to be minimal, the operator should perform thorough prophylaxis, etch the enamel surface according to manufacturer's instructions and exercise maximum moisture control during the entire bonding procedure. Uppal et al. in 2013 carried out a study to determine the effect of a bond enhancing agent upon the shear bond strength of a self cure direct bonding agent on dry and wet (saliva contaminated) enamel and concluded that the bond enhancing agent is not recommended to be used routinely in cases where meticulous isolation is possible, since no significant increase in the bond strength was observed under dry condition. Mandava et al. in 2014 investigated the effect of moisture, saliva, and blood contamination on the shear bond strength of orthodontic brackets bonded with the conventional bonding system and self-etch bonding system and concluded that conventional bonding system showed higher shear bond strength values than the self-etch bonding system under dry enamel surface conditions and self-etch bonding system showed higher shear bond strength values than the conventional bonding system under all wet conditions. Also, in both the systems, the weakest mean bond strength was achieved in the presence of blood contamination. Amirabadi et al. 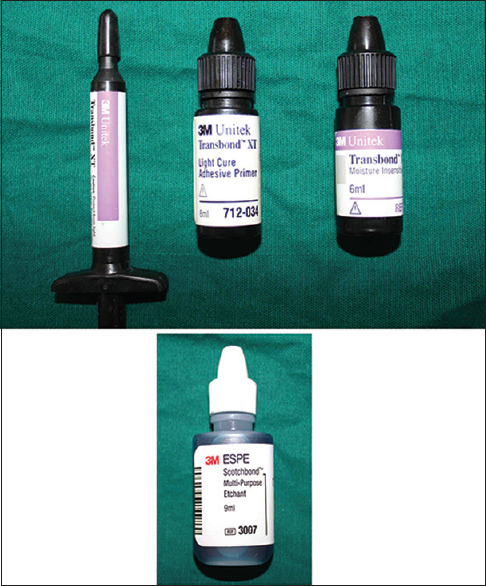 in 2014 compared the bond strength of Transbond XT, and Assure Universal Bonding Resin to dry and saliva contaminated enamel and concluded that bonding stainless steel brackets to the enamel surfaces with Assure Universal Bonding Resin produced adequate bond strength in both dry and saliva contaminated conditions and thus, can be used for bonding orthodontic brackets to the enamel surface in the clinical setting. 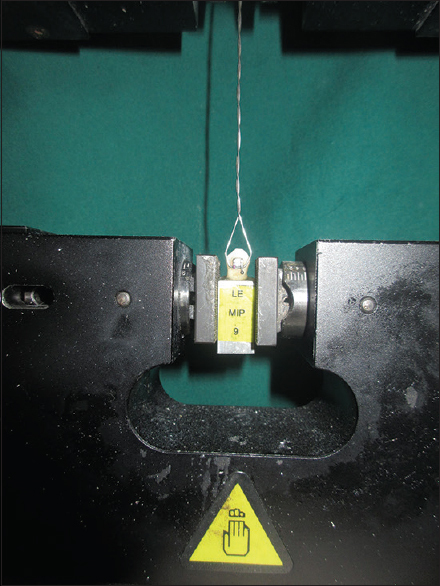 A study conducted in 2014 undertook a study to evaluate and compare the shear bond strength of MIP, BisCover and conventional (Transbond XT) primer under both dry and contaminated (saliva and blood) condition and found out that BisCover and MIP can be applied to tooth surface before bracket bonding without affecting bond strength. They also concluded that blood contamination on acid etched surface reduces bond strength to a greater extentMthan saliva contamination and when BisCover or MIP was used, the negative effect of blood or saliva contamination on bond strength was prevented. Anand et al, in 2014 investigated the effectiveness of MIP with respect to conventional hydrophobic primer by comparing their SBS and adhesive failure locations after contamination with two different conditioning agents, namely, natural saliva and saliva substitute. They found that Transbond XT adhesive with Transbond MIP have clinically acceptable bond strength in wet fields. Shukla et al. in 2014 compared the mean shear bond strength of moisture insensitive primer (MIP) used for orthodontic bonding in the presence and absence of saliva and concluded that Moisture insensitive primer is effective in the presence/absence of moisture and has shown SBS value of more than 7.8 Mpa, hence material is suitable for clinical use. Bradburn and Pender in 1992 conducted a study of the bond strength of two light cured composites used in the direct bonding of orthodontic brackets to molars and concluded that precuring the adhesive material on to the bracket base improves the resin – bracket base bond. Cacciafesta et al. in 1998 conducted a study on the effects of saliva and water contamination on the enamel shear bond strength of a light-cured glass ionomer cement and concluded that shear bond strength appeared to be significantly enhanced by the contamination of the enamel surface with either saliva or water. Itoh et al. in 1999 did a study on the effect of contamination and etching on enamel bond strength of new light-cured glass ionomer cements and concluded that water contamination had deleterious effect while saliva was less deleterious to the bond strength on the unetched enamel surface. Eliades et al. in 2002 published a paper to examine the soundness of conventional orthodontic bonding assessment methods and concluded that, it is essential to eliminate some of the apparent deficiencies existing in research protocol design and investigations performed with vaguely defines objectives and implementing erroneous methodologies sacrifices the purpose of the research. Webster et al. in 2001 conducted a study on the effect of saliva on shear bond strengths of hydrophilic bonding systems and concluded that non contaminated enamel surfaces had the highest bond strengths for both the hydrophilic and hydrophobic materials. Güngör et al. in 2013 conducted a study to evaluate the effects of contamination by either blood or a haemostatic agent on the shear bond strength of orthodontic buttons and concluded that contamination of tooth surfaces with either blood or blood stopper significantly decreased the SBS of orthodontic buttons Hence, etching and bonding procedures should therefore be delayed until complete removal of the contaminating agent. Chávez et al. was conducted to compare the resistance when debonding the braces of the enamel after 60 minutes and 24 hours of its fixation with two different adhesive systems.60 bicuspids where divided into 4 groups of 15 samples each one and were treated with self-etching adhesive SEP Transbond Plus 3M Unitek (group 3 and 4) and conventional adhesive TransbondMIP 3M Unitek (group1 and 2). Mavropoulos et al, in 2002 evaluated and compared the clinical performance of two new moisture-resistant orthodontic adhesive systems:a chemically-cured composite resin (Unite, 3M Unitek, Monrovia, California, USA) in conjunction with a special moisture-resistant primer (Transbond MIP, 3M Unitek, Monrovia, California, USA); and a fluoride-releasing light-cured compomer concluded that The new moisture-resistant adhesive systems under study were found to be clinically efficient, though Assure exhibited a significantly higher bond failure rate than Unite and Transbond MIP. Bishara et al. in 2002 conducted a study to assess the effect of saliva contamination on the shear bond strength of orthodontic brackets, at various stages of the bonding procedure using a new self-etch primer and concluded that by reducing the number of steps during bonding with the use of acid-etch primers, clinicians are able to minimize enamel loss, save time, as well as reduce the potential for error and contamination during the bonding procedure. The results indicated that the newly introduced self-etch primers, containing both the enamel etchant and primer have the potential to be successfully used in bonding orthodontic brackets even after light salivary contamination. Ambika et al. 2012 in a systematic review emphasized the effect of contamination on bond strength of orthodontic light cure adhesives and concluded that contamination by water, saliva and blood affects the bond strength of all orthodontic adhesives either before or after the application of primer. Also, effect of these contaminations on SEP after its application is found to be less and Fuji Ortho LC is unaffected by these contamination irrespective of its nature. Goswami, et al. in 2014 performed a study with an aim to compare the in vitro SBS and debonding characteristics of MIP and SEP in combination with a color changing adhesive system under both dry and contaminated condition and concluded that in clinical situations where there is risk of contamination from saliva, both the MIP and SEP in conjunction with a hydrophilic adhesive can be equally effective. Depra et al. in 2013 evaluated the influence of saliva contamination on the bond strength of metallic brackets bonded to enamel with hydrophilic resin composite and summarized that saliva reduces shear bond strength when brackets are bonded with hydrophobic resin Transbond XT. However, bond strength was not affected by saliva contamination when brackets are bonded with adhesive system and resin with hydrophilic properties. Sunil Kumar et al. 2015 conducted a study to evaluate the shear bond strength of the brackets bonded with adhesive and flowable composites under contamination by human blood and human saliva and summarized that with the use of a primer, flowable composites could be used to bond the orthodontic brackets under contamination and decontamination with air-water spray for 5 s. Furthermore, air drying the contaminated surface before bonding seems to be satisfactory if contamination occurs after the application of the primer. Although literature exists on the effects of saliva and moisture contamination comparing MIP with conventional primer,. Seventh generation bonding agent (moisture insensitive primer, [MIP]) is the latest entrant and the first no-mix bonding adhesive, which sets in the presence of moisture giving effective bond strength It has been difficult for operators to make moisture free oral environment during bonding. Many procedures where isolation is a problem like bonding on impacted teeth etc., MIP is totally insensitive to moisture and. 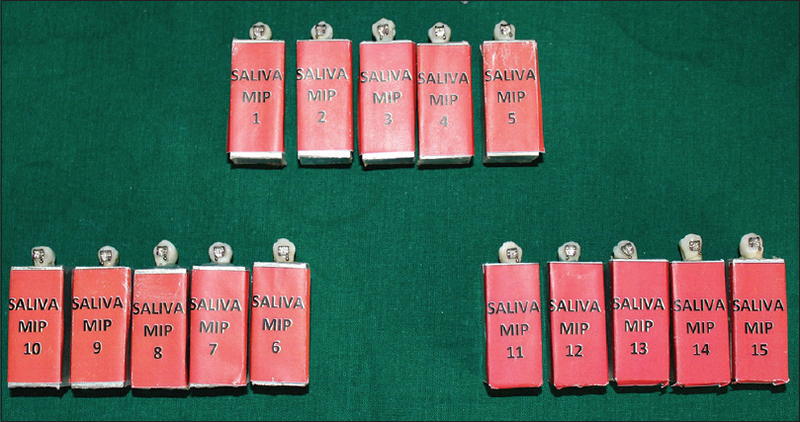 The shear bond strength and brackets when bonded with conventional bonding and MIPs, with simulation of the oral environment using artificial saliva incubated at 37°C for 24 h.
The aim of this study is to compare the shear bond strength of orthodontic brackets bonded with a MIP (Transbond MIP, 3M Unitek) against a conventional primer (Transbond XT, 3M Unitek) when contaminated with saliva. 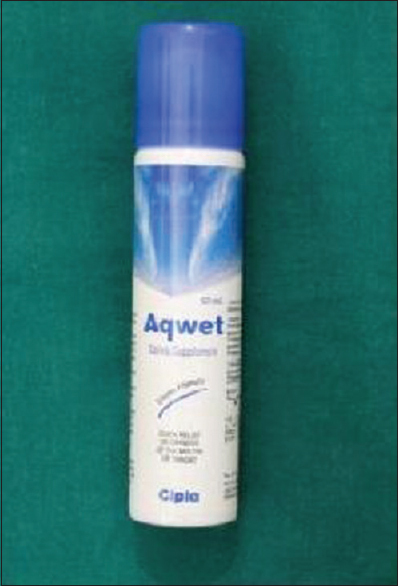 A commercially available artificial saliva (AQWET, CIPLA) was used for contamination purpose. Ivoclarbluephase N LED light curing unit was used for curing purpose. Maxillary 1st premolars extracted due to periodontal involvement with intact enamel surfaces. The light cure bonding adhesive used to bond the brackets for the study was Transbond MIP (3M Unitek, U. S. A) and Transbond XT (3M Unitek, U. S. A) and 3M scotchbond TM Etchant [Figure 1]. 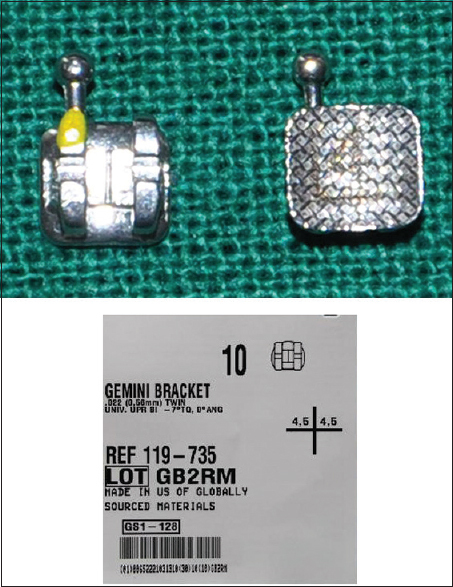 Orthodontic metal upper premolar brackets: 0.022 × 0.028 slot (Gemini series, 3M Unitek) [Figure 2] were used. The bracket base surface area was 9.61 mm2 as per information provided by the manufacturer. A commercially available artificial saliva (Aqwet, Cipla, Satara, India) [Figure 3] was used which contains sodium carboxymethyl cellulose (1.0% w/vol), sorbitol (3% w/v), potassium chloride (0.12%w/v and sodium chloride (0.12% w/v) was used for contamination purpose. 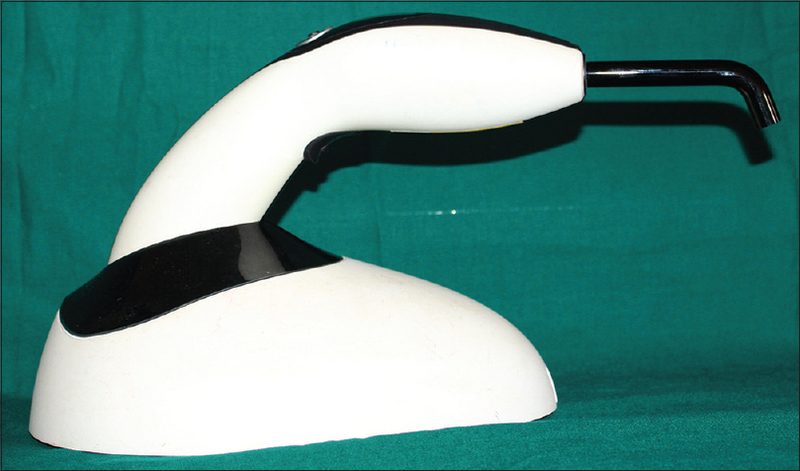 The curing light used to initiate polymerization from the source is IVOCLAR BLUEPHASE N halogen light curing unit [Figure 4] (Liechtenstein) Specification of light curing unit: Light intensity: 1200 mW/cm2, Output wavelength: 380–552 nm. An aluminum-mounting jig [Figure 5] was fabricated with the following dimensions: A customized square aluminum block of 50 mm in length and 30 mm in width was selected to which acrylic resin was filled and tooth was embedded in it. An Instron Universal Testing Machine (3M model number – 33R – 4467, UK) was used to assess the shear bond strength of the brackets. The Scanning Electron Microscope was used to study the surface characteristics of teeth after debonding (Magnus, Olympus, Japan). An Instron Universal Testing Machine (ITM) (3M model number – 33R – 4467, UK) was used to assess the shear bond strength of the brackets. The Scanning Electron Microscope was used to study the surface characteristics of teeth after debonding (Magnus, Olympus, Japan) [Figure 6]. GROUP-II – Moisture – Insensitive Primer (Transbond MIP, 3M Unitek). Group IV transbond MIP with saliva contamination. The buccal surface of the 1st premolar teeth was etched with 37% phosphoric acid for 30 s and dried with three-way syringe for 10 s. Transbond XT primer was applied to the etched enamel surface, and then brackets were bonded with Transbond XT and Light cured for 30 s [Figure 7]. The buccal surface of the 1st premolar teeth was etched with 37% phosphoric acid for 30 s and washed with water for 10 s and dried with three-way syringe for 10 s. Three drops of MIP was taken and coated on the labial surface for 2 to 3 s, and then the bracket was bonded with Transbond XT adhesive and light cured for 30 s [Figure 8]. The buccal surface of the premolar teeth was etched with 37% phosphoric acid for 30 s were washed with three-way syringe for 10 s. Two coats of saliva were applied to the etched surface; excess saliva was blotted with gauge leaving the surface moist. Transbond XT primer was applied and then brackets were bonded with transbond XT adhesive and light cured for 30 s [Figure 9]. The buccal surface of the 1st premolar teeth was etched with 37% phosphoric acid for why 15 S, others were for 30 s and washed with water for 10 s and dried with three-way syringe for 10 s. Two coats of saliva were applied to the etched surface and excess was blotted with gauze leaving the surface moist. Three drops of Transbond MIP primer was taken and one labial coat of MIP was applied covering the etched surface using an application brush. Oil-free air was blown for 2–5 s aimed perpendicular to labial surface and then brackets were bonded with Transbond adhesive and light cured for 30 s [Figure 10]. 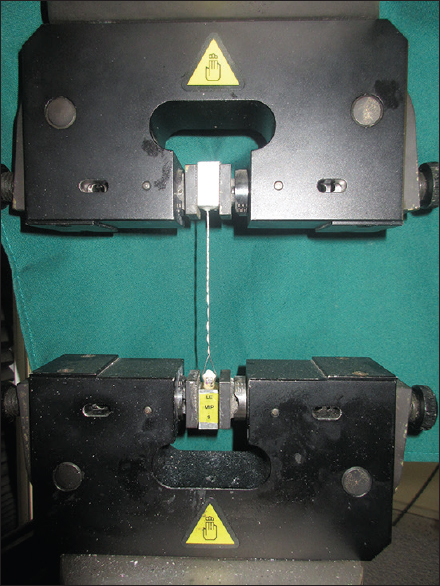 After bonding, all the specimens were stored in distilled water at 37 Straight length 0.019 × 0.025 inch stainless steel wire was bent and ligated in the slot bracket, to provide a means of application of shearing force by the Instron machine. The bracket base area for metal brackets (Gemini Series, 3M Unitek) is 9.61 mm2 as per information provided by the manufacturer. Results obtained in this study indicate that both Transbond XT and Transbond MIP had adequate bond strength in the non contaminated dry field. There was a significant increase in the shear bond strength of enamel surface primed with Transbond MIP when contamination was done with saliva. The significance of MIP was seen when saliva contamination was done after primer application and also before primer application compared to Transbond XT. This may be attributed to the known composition of MIP and its hydrophilic nature. Results also show that there is no significant difference in the bond strength between Transbond XT and Transbond MIP in the non contaminated state in Group I and Group II showed (‘p’ value 0.233) [Table 2] Even though Transbond XT showed slightly higher bond strength values than Transbond MIP, the result was not statistically significant with a p value of 0.114 for before primer application. There was no significant difference in the bond strength between Transbond XT and Transbond MIP in contaminated state in Group III and Group IV showed (p value of 0.027) [Table 3]. After primer application and p value of 0.074 before and after primer application. 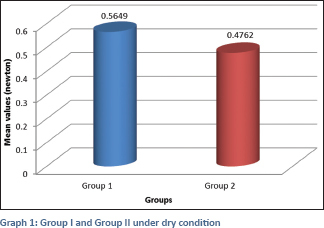 The Mean value of Group I and Group II showed 0.5649 and 0.4762 under dry condition as shown in [Graph 1]. 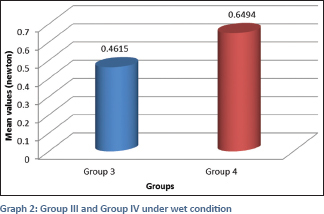 The Mean value of Group III and Group IV showed 0.4615 and 0.6494 reapectively under wet condition as shown in [Graph 2]. Although Transbond XT showed slightly more bond strength than that of MIP in the non contaminated categories, it was not statistically significant. Even though none of the samples in this study showed enamel fracture, careful measures have to be carried out during the bonding procedures to prevent the risk of enamel fractures from happening. From the results and the observations of this study we can say that Transbond MIP can be used in a situation where saliva contamination is expected to hinder the bonding procedures. Even though Transbond XT showed acceptable bond strength during saliva contamination. In saliva contaminated conditions, washing off the saliva and re-priming have shown to give acceptable bond strength. Further studies have to be conducted on these materials under different conditions to analyse their efficiency. One of the major changes of the 20th century in the field of orthodontics was the successful bonding of the brackets to the teeth replacing the old system of banding. This was made possible by the introduction of the acid-etching technique by Buonocore Newman was the first to bond orthodontic brackets to the teeth using the acid-etching technique. Etching and priming are two of the most critical steps where the tooth surface should be kept isolated from all contaminants. Contamination of the etched surface during bonding procedures becomes a problem because the bond strength gets reduced considerably. Enamel surface contamination can occur at two critical stages of the bonding procedure: (1) After the tooth surface has been etched and (2) After the primer has been applied. Following saliva contamination, a biofilm forms over the etched enamel, the micro-porosities gets plugged, and the penetration of the resin IS impaired, resulting in resin tags of insufficient number and length. Hence, the bond strength gets compromised. The most common contaminants of enamel during bonding procedures are saliva and blood. While saliva is present in all bonding situations, blood becomes a problem if there is gingivitis or during surgical exposure of impacted teeth. Saliva consists mostly of water (99%), polysaccharides, proteins, and enzymes. Conventional BIS-GMA orthodontic adhesive and primer contains Triethylene Glycol Dimethacrylate, Bisphenol A Diglycidol ether dimethacrylate. Despite their hydroxyl groups, they require dry etched enamel for mechanical adhesion which is largely due to their hydrophobic properties of functional monomer and absence of chemical adhesion. To overcome these problems, adhesives more tolerant of moisture in the form of hydrophilic primers have been developed. One modification to achieve this is to add acetone or ethanol to the primer as a solvent. Both substances can repel water and therefore should be less sensitive to contamination. The Transbond MIP has ethanol, which is responsible for humidity tolerance and can enhance the adhesive strength when there is the minimal presence of sulcus fluid or moist breath. Saliva contamination, however, covers the surface with not only considerable amounts of moisture but also substantial organic material. In addition to micromechanical retention, a reversible hydrolytic bond mechanism can be established by breaking or reforming of carboxylate salt complexes formed between the ionized carboxyl groups of methacrylate functionalized polyalkeonic acid copolymer and residual enamel calcium. This mechanism might enhance their performance under contaminated conditions. Many studies have been done to assess the effectiveness of Transbond MIP; Grandhi et al. in 2001 conducted a study on shearbond strength of stainless steel orthodontic brackets with a moisture insensitive primer and concluded that in situ ations in which moisture control is difficult, consideration should be given to using MIP along with Transbond XT. Hence, this study was done to find out if these hydrophilic primers show acceptable bond strength without saliva and when contaminated by with saliva. Furthermore, a comparison was done to see if the bond strength varied at different stages of contamination by the above said contaminants. Distilled water with 0.1% (weight/volume) Thymol was used for storage of teeth during collection. After bonding, the samples were stored in saline at room temperature for 12 h before testing for shear bond strength. Distilled water and saline does not alter the properties of the tooth surface and at the same time maintains the hydration level of the teeth. Further addition of 0.1% (weight/volume) Thymol is reported to inhibit the bacterial growth. Use of the autoclave and chemicals such as peroxides, glutaraldehyde, or normal saline were avoided as they can alter the properties of enamel and can give biased results as reported by Eliades and Brantley in their study. Clinically, acceptable bond strengths have been reported to range from 5 Mpa to 8 Mpa. This bond strength is considered to withstand various shear, compressive, and tensile loads. However, the clinically acceptable shear bond strength for orthodontic brackets to enamel is still unknown. There is a wide variation in the bond strength values in the literature. Previous studies using Transbond MIP primer with Transbond XT resin adhesive have reported bond strengths ranging from 10.4 Mpa to 20 Mpa. The mean bond strength obtained in this study was well above the clinically acceptable bond strength values indicating the use of these hydrophilic bonding materials in contaminated environments (Mean 8.5 Mpa for Transbond XT and 9.25 Mpa for Transbond MIP). On comparison of bond strengths of MIP and XT when contaminated with saliva, statistically significant values were obtained with contamination with saliva after primer application. There was a significant increase in the bond strength obtained after primer application (P = 0.023) and before and after primer application (P = 0.003*). Hence, we can infer that Transbond MIP can be used to achieve adequate bond strength in conditions where saliva contamination is expected. Comparison of the shear bond strength of Transbond MIP between different stages of contamination with saliva showed that maximum bond strength achieved by Transbond MIP was in the contaminated stage. When contaminated, there was a significant increase in the bond strength. Saliva contamination stages showed a statistically significant P = 0.030. Nirupama et al. compared the shear bond strength of hydrophilic bonding material Transbond MIP and XT after contamination with artificial saliva and concluded that non contaminated surfaces had the highest bond strength for both hydrophilic (Transbond MIP) and hydrophobic materials (Transbond XT) when compared to contaminated samples. This may be attributed to the known composition of MIP and its hydrophilic nature. Results obtained in this study indicate that both Transbond XT and Transbond MIP had adequate bond strength in the noncontaminated dry field. There was a significant increase in the shear bond strength of enamel surface primed with Transbond MIP when contamination was done with saliva. The significance of MIP was seen when saliva contamination was done after primer application and also before primer application compared to Transbond XT. This may be attributed to the known composition of MIP and its hydrophilic nature. Swami et al. 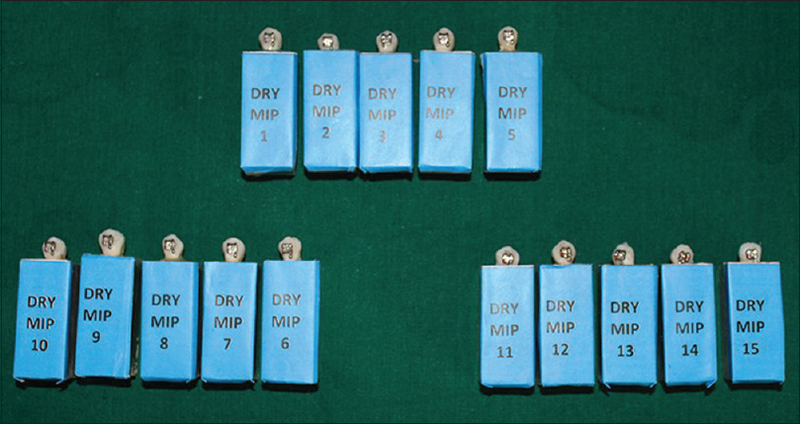 in 2009 conducted a study to measure and compare the shear bond strength of orthodontic stainless steel brackets bonded to enamel both in dry and wet environment with Transbond XT, SEP and MIP and summarized that SEP and MIP both perform equally in dry and wet mediums. Results also show that there is no significant difference in the bond strength between Transbond XT and Transbond MIP in the noncontaminated state (P = 0.803). Even though Transbond XT showed slightly higher bond strength values than Transbond MIP, the result was not statistically significant with a P = 0.114 for before primer application, P = 0.253 after primer application and P = 0.074 before and after primer application. Although Transbond XT showed slightly more bond strength than that of MIP in the noncontaminated categories, it was not statistically significant. Even though none of the samples in this study showed enamel fracture, careful measures have to be carried out during the bonding procedures to prevent the risk of enamel fractures from happening. From the results and the observations of this study, we can say that Transbond MIP can be used in a situation where saliva contamination is expected to hinder the bonding procedures. Even though, Transbond XT showed acceptable bond strength during saliva contamination. In saliva contaminated conditions, washing off the saliva and re-priming have shown to give acceptable bond strength. Further studies have to be conducted on these materials under different conditions to analyze their efficiency. Under wet conditions, MIP (Transbond MIP) showed the highest shear bond strength and hence can be considered as a material of choice in wet conditions. Although the present study offered encouraging clinical possibilities, it must be accepted with guarded optimism. Furthermore, clinical trial of all these materials should be undertaken to obtain a clearer and more comprehensive picture. In vitro studies provide very important data concerning the physical and mechanical properties of a material, but the final evaluation can only be provided when the efficiency of these materials are assessed under clinical conditions. Hence, it is necessary to assess the bond strength of MIP clinically. Therefore, in vivo studies have to be performed to evaluate the performance of this material. Newman GV. Epoxy adhesives for orthodontic attachments: Progress report. Am J Orthod 1965;51:901-12. Sheykholeslam Z, Brant S. Factors affecting the bonding failures of orthodontic attachments of the tooth surface. JCO 1977;76:236-8. Uppal S, Somani D, Bhatia AF, Kishnani R, Mehta F, Kubavat AK. Effect of a bond enhancing agent upon shear bond strength of self cure direct bonding orthodontic resin on dry and wet (saliva contaminated) enamel – An in vitro study. Indian J Dent Sci 2013;5:125-9. Prasad M, Mohamed S, Nayak K, Shetty SK, Talapaneni AK. Effect of moisture, saliva, and blood contamination on the shear bond strength of brackets bonded with a conventional bonding system and self-etched bonding system. J Nat Sci Biol Med 2014;5:123-9. Amirabadi GE, Shirazi M, Shirazi Z. Effect of saliva contamination on shear bond strength of transbond XT and assure universal bonding resin to enamel. J Islam Dent Assoc Iran 2014;26:173-83. Sudhan M, Laxmikant SM, Shetty PC, Ramachandra CS, Bhat S. An evaluation of the bond strength using two different primers (moisture insensitive primer and new liquid polish sealer) in presence of blood and saliva contamination: An in vitro study. J Indian Orthod Soc 2014;48:319324. Anand MK, Majumder K, Venkateswaran S, Krishnaswamy NR. Comparison of shear bond strength of orthodontic brackets bonded using two different hydrophilic primers: An in vitro study. Indian J Dent Res 2014;25:191-6. Shukla C, Singh G, Jain U, Swamy K. Comparison of mean shear bond strength of light cure, self-cure composite resins, self-etching and moisture-insensitive primers: An in vitro study. J Indian Orthod Soc 2012;46:254-7. Bradburn G, Pender N. An in vitro study of the bond strength of two light-cured composites used in the direct bonding of orthodontic brackets to molars. Am J Orthod Dentofacial Orthop 1992;102:418-26. Cacciafesta V, Jost-Brinkmann PG, Süssenberger U, Miethke RR. Effects of saliva and water contamination on the enamel shear bond strength of a light-cured glass ionomer cement. Am J Orthod Dentofacial Orthop 1998;113:402-7. Itoh T, Matsuo N, Fukushima T, Inoue Y, Oniki Y, Matsumoto M, et al. Effect of contamination and etching on enamel bond strength of new light-cured glass ionomer cements. Angle Orthod 1999;69:450-6. Eliades T, Brantley WA. The inappropriateness of conventional orthodontic bond strength assessment protocols. Eur J Orthod 2000;22:13-23. Webster MJ, Nanda RS, Duncanson MG Jr., Khajotia SS, Sinha PK. The effect of saliva on shear bond strengths of hydrophilic bonding systems. Am J Orthod Dentofacial Orthop 2001;119:54-8. Güngör AY, Alkis H, Turkkahraman H. Effects of contamination by either blood or a hemostatic agent on the shear bond strength of orthodontic buttons. Korean J Orthod 2013;43:96-100. Chavez JAR, Santana FHB, Yanez SAB, Alatorre JAA. Comparison of the shear bond strength of brackets between two adhesive systems (SEP and MIP Transbond) at 60 minutes and 24 hours. Revista mexicana de ortodoncia 2013;1: 38-43. Mavropoulos A, Karamouzos A, Kolokithas G, Athanasiou AE. In vivo evaluation of two new moisture-resistant orthodontic adhesive systems: A comparative clinical trial. J Orthod 2003;30:139-47. Bishara SE, Oonsombat C, Ajlouni R, Denehy G. The effect of saliva contamination on shear bond strength of orthodontic brackets when using a self etch primer. Angle Orthod 2002;72:554-7. Ambika K, Kumar SA, Sundari KS. Effect of contamination on bond strength of orthodontic light cure adhesive system – A systematic review. Int J Curr Res Rev 2012;4:43-9. Goswami A, Mitali B, Roy B. Shear bond strength comparison of moisture-insensitive primer and self-etching primer. J Orthod Sci 2014;3:89-93. Deprá MB, de Almeida JX, da Cunha Tde M, Lon LF, Retamoso LB, Tanaka OM, et al. Effect of saliva contamination on bond strength with a hydrophilic composite resin. Dental Press J Orthod 2013;18:63-8. Sunil Kumar M, Mahantesh C, Umesh HM, Talwar A, Qaiser S, Sahasrabudhe S. A comparison of shear bond strength of orthodontic brackets bonded with four flowable composites bonded under contamination: An ex-vivo study. Int J Mater Sci Appl 2015; 4:47-51. Grandhi RK, Combe EC, Speidel TM. Shear bond strength of stainless steel orthodontic brackets with a moisture-insensitive primer. Am J Orthod DentofacialOrthop 2001;119:251-5. Swami VD, Deshmukh SV, Sable RB. Evaluation of shear bond strength of orthodontic stainless steel brackets with self etching primer and moisture – Insensitive primer – An in vitro study. J Indian Orthod Soc 2009;104:32-8.